It is a commonly accepted practice to always get a good sear on certain cuts of meat. Some slow cooker cookbooks recommend searing meat before cooking it low and slow for many hours. As most food geeks, and any fan of Alton Brown knows, the main purpose of searing is to improve the flavor of the meat through the Maillard reaction, and has nothing to do with sealing in juices. Since this reaction only occurs at very high temperatures, sous vide recipes often call for the meat to be seared before serving. Is searing more than just cosmetic, or is a good steak really all about being properly cooked on the inside? Given the importance placed on using high heat when cooking burgers and rib-eyes, searing seems like it is an important step. However given how delicious prime-rib can be while only having a crust around the very edge, unseared meat should also be quite tasty. Put 6 quarts of water into the stock pot. Place sous vide immersion circulator into the stock pot. 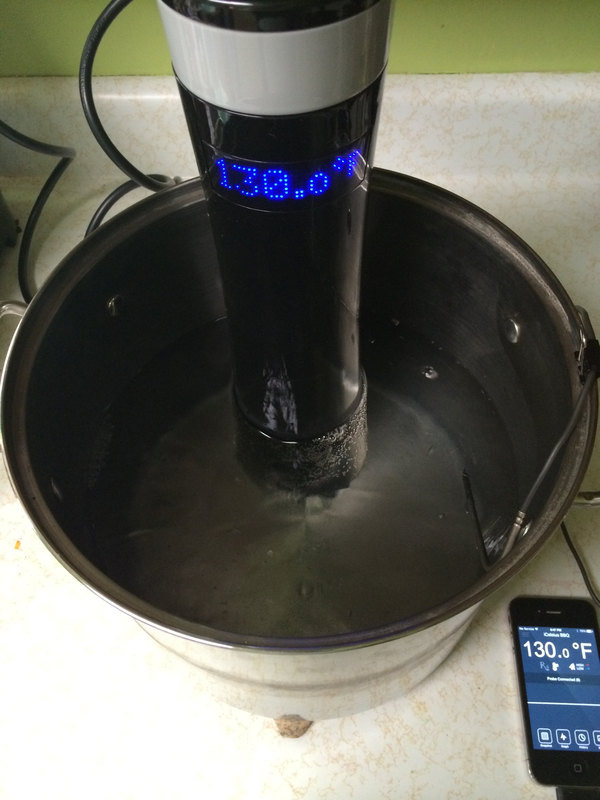 Turn sous vide immersion circulator on, and set temperature to 130.0ºF. 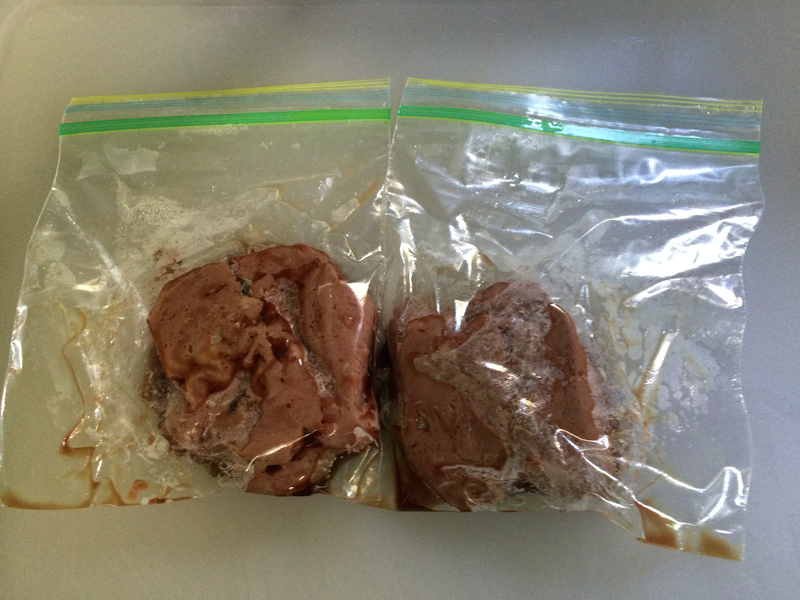 While to water is heating, place each steak into its own zip-top bag. Remove as much air as possible from the bags, and seal them. Once steaks are heated to 130ºF all the way through, put a small amount of canola oil in the cast iron skillet and heat it over high heat to about 450ºF to 500ºF as indicated by the infrared thermometer. When the skillet is hot, remove steaks from zip-top bags and place one of the steaks into the pan for 30 seconds, flip and cook for another 30 seconds. Allow steaks to rest for at least 5 minutes. Taste both steaks and record results. We had fully intended to track the temperature of the water over time during the experiment, however changes to the iCelsius software used coupled with user error prevented that from happening. 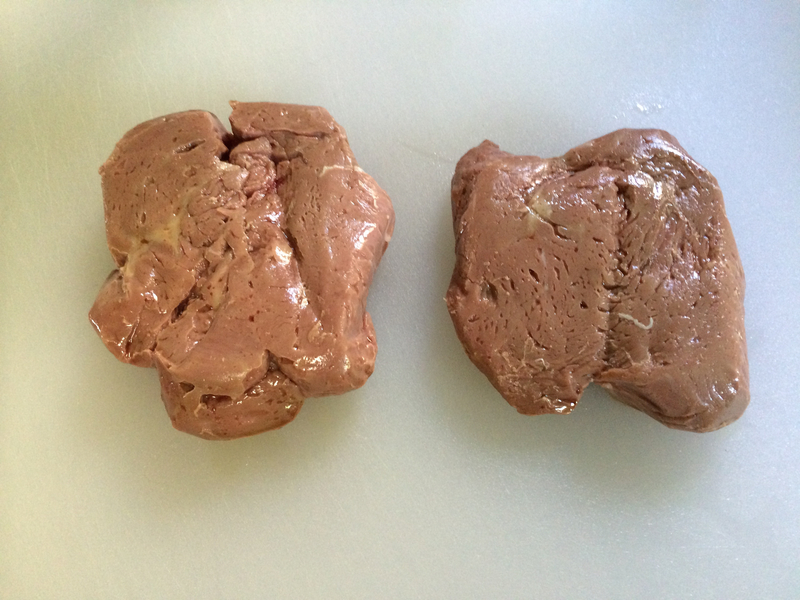 Freshly unpacked, both steaks look very similar. 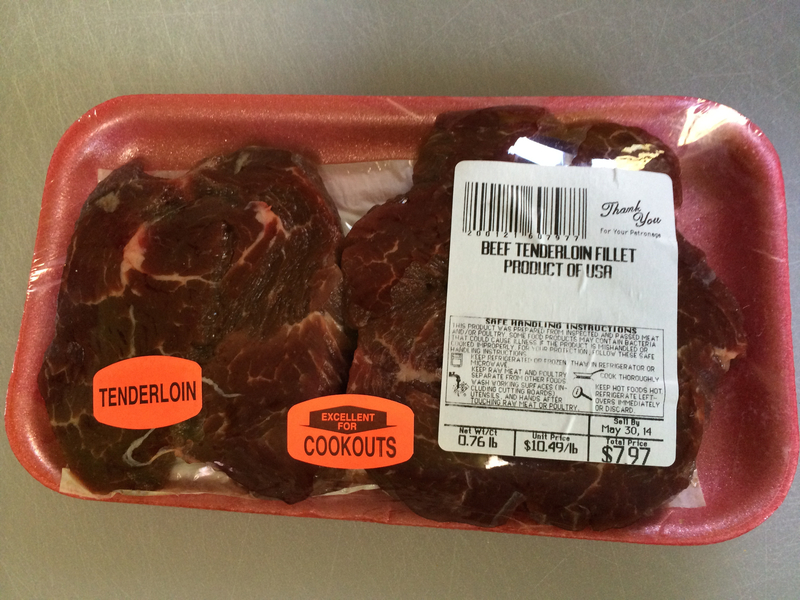 Before cooking, both steaks were placed into their own zip-top bags. 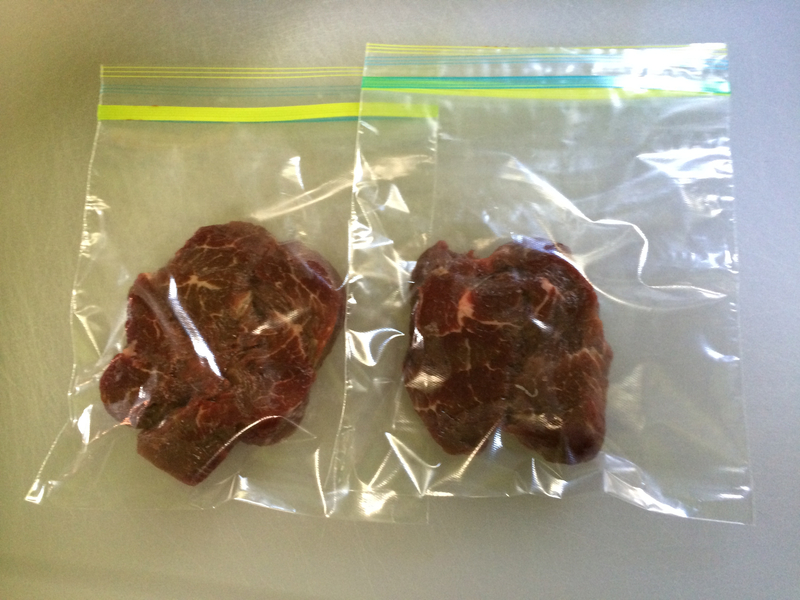 Raw steaks bagged and sealed, ready for the water. In the meantime, the water was heating to a steady 130.0ºF. 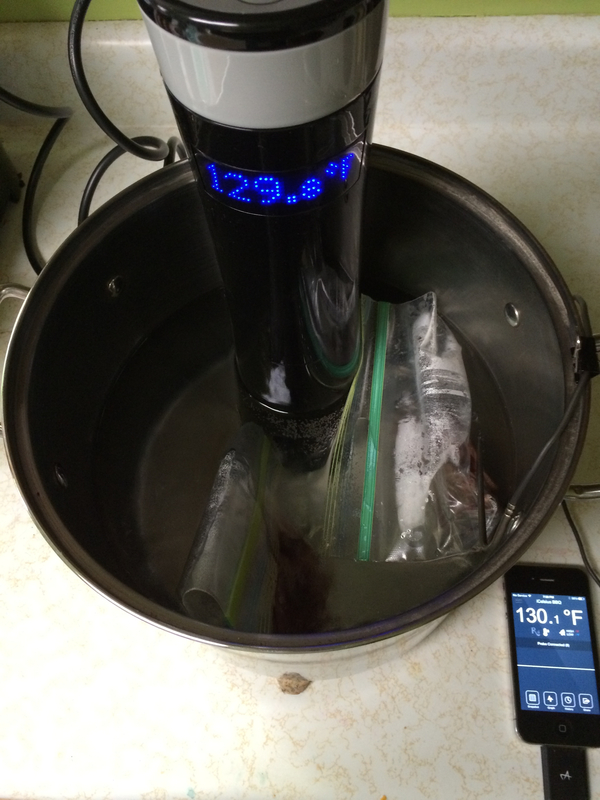 Sous vide rig with the water at a steady 130.0ºF, ready for the meat to be added. 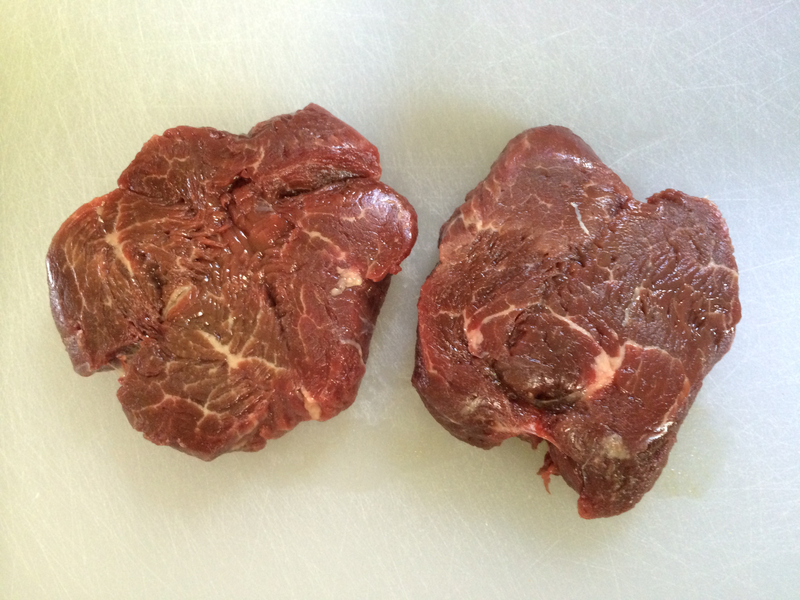 After 40 minutes in the water bath, the steaks should both fully cooked to medium-rare. Unfortunately one of them was considerably thinker than we thought, and only got to 121.2ºF internally. This wasn’t noticed until after the searing of the other steak had been completed. The seared steak had an internal temperature of 135.6ºF after searing. After about 40 minutes, the steaks should be fully cooked. Once the steaks were full cooked they were removed from the water bath. During cooking a fair amount of juice escaped from the meat. When taken out of the bags they had the pink color that is expected in the inside of a medium-rare steak. They even had a nice beefy aroma, but looked quite odd with pink exteriors, a bit like pink silly putty. After cooking the meat was certainly the nice pink color associated a properly cooked steak. One of the steaks was then seared in a hot cast iron skillet for 30 seconds on each side. 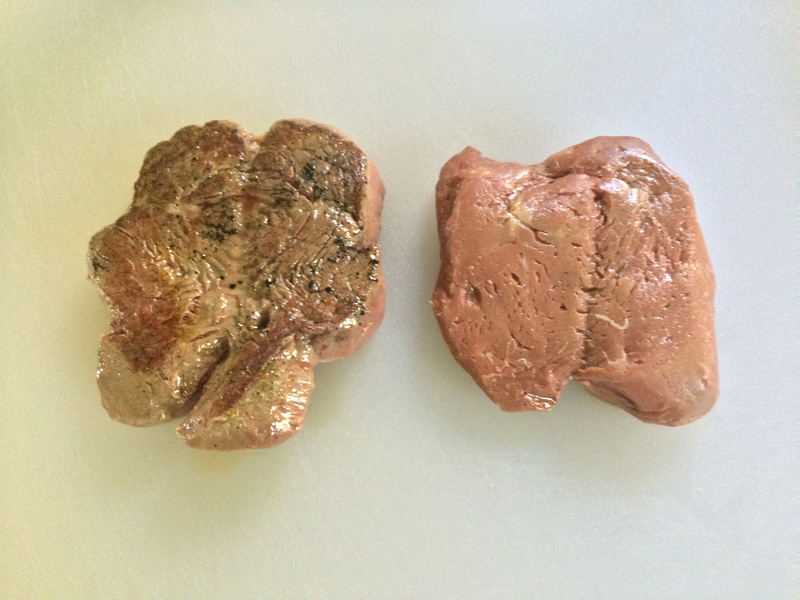 After searing one steak (left) for 30 seconds on each side on a hot cast iron skillet. The other steak (right) was left unseared. Once one of the steaks was seared, they were cut in half to show the cross-section. The final product cut in half to show cross-section. Both steaks are evenly done all the way through, with the seared steak having the familiar brownish color on the surface. The black flecks are bits of carbon liberated from the skillet by the tongs, oops! The steaks were then tasted by myself and Brownie Master P.
Taste Delicious, but improved slightly with addition of salt and pepper. Also delicious, and improved much more noticeably with the addition of salt. Seared tasted better, salt helped both, but the seared one still wins by a very narrow margin. Texture More complex texture. Nice texture and mouth feel, but not as interesting as seared steak. Hands down, seared was simply more interesting to chew. Appearance Nice browned color and perfectly pink all the way through when cut. Pink all the way through as well as the surface. Certainly not what one expected a steak to look like. The seared steak simply looks like a steak is expected to look. The shininess of the unseared steak is a little weird. While both steaks were good and if presented by themselves would each be excellent, albeit a little weird in the case of the unseared steak, the seared steak was the clear winner. The amount of fluid that leaked out of the meat during cooking was a bit surprising. Unfortunately the amount of fluid lost wasn’t quantified. Also, the smell of the meat when it came out of the zip-top bags was a bit startling. Normally when cooking, you can slowly start to smell the meat as it cooks, but with sous vide you don’t get any indication of cooking until you open the bag and encounter the familiar aroma of cooked meat. While the seared and the unseared steaks were both very good, the seared steak was slightly more enjoyable. The searing, in addition to improving the flavor also provided a more interesting texture to the meat. The seared steak also simply looks more like what a steak is expected to. So, while the unseared steak was pure awesome, the seared steak was at least 3 kinds of awesome, taste, texture and visual appeal. Is it better to sear before or after cooking? What is the optimal amount of time to get a good sear? When is the best time to season the meat? How much mass is lost during cooking? How does that compare to other cooking methods such as grilling or pan searing? How much does the searing affect the final internal temperature of the meat? How much electricity is actually used? Would an insulated or cast iron pot affect the amount of electricity used. Can less expensive cuts of meat such as chuck tenders be used as a cost effective alternative to more expensive steaks? If you’re cooking a frozen steak, can you thaw it and cook it directly via sous vide? Will we get tired of steak before we finish answering all of these questions?